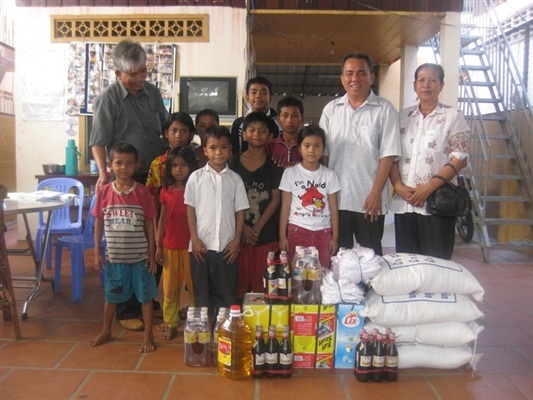 Mrs. Kang Sipha and hers cambodian family have donated 200 kg. of rice, 5 noodles boxes, toothtaste,soaps, sausages, biscuits, candies and shampoos. Ms. Marnie Rogers and her boyfriend, Ben Jonhson, have donated a washing machine to wash clothes for LRDE's children. Mrs. Carine Teng from Singapore has donated 500 $, 300 kg. of rice, candy, books and pencils to LRDE. Thank you. 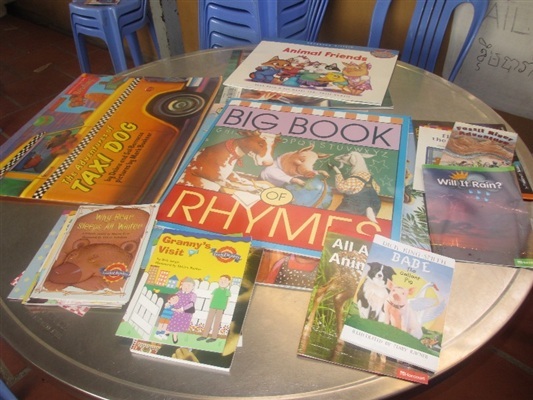 Room to Read Cambodia has donated to the Restaurant 30 english books for children. His Excellency Say Chhum, Vice President of the Senate, has donated 30 boxes of complementary goods for babies from 6 to 24 months. Mrs. Kim Chanthou, wife of HE Nim Thot, presented the activities of the restaurant to His Excellency Say Chhum and donated a box of clothes for the children. This morning at 12.16 a small child withdrew the meal n° 100,000 since the restaurant is open. Today there was a meeting with parents and relatives of children's restaurant to discuss their studies. We have distributed hygiene materials to participants. In total, between children and parents were 320 people present. 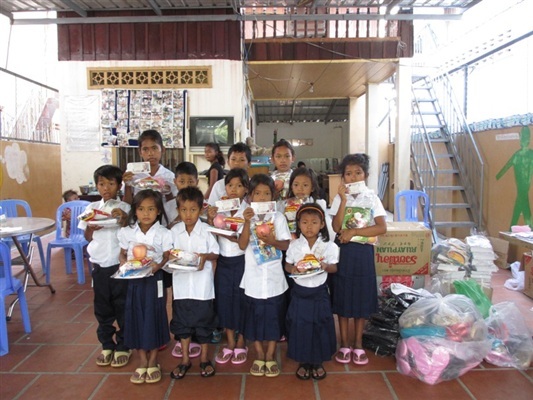 Today 30 street's children have gone to the Charity Party at Mekong University. The children at the party performed a dance that represented the history kmerr. 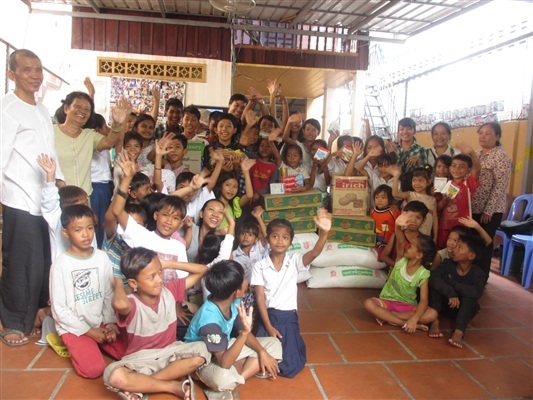 A Cambodia Volunteer Foundation has donated to the Restaurant 5 boxes of noodle, 5 bags of rice, canned fish and soy sauce. Thanks. 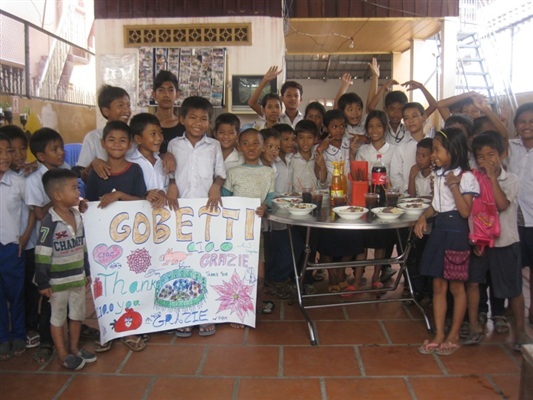 The Learning Circle Gobetti of Turin on the occasion of the traditional Christmas market has collected a large sum which has donated to our restaurant. Mrs. Cristina Neri and her daughters Elise and Sara Bellan have donated at Restaurant 200 €. Thanks from all the children of the restaurant. We have two new volunteers who come to the restaurant and teach children how to keep teeth clean before and after eating. Thanks. Mr. Umberto Cocchiaro has donated 100 € to the Restaurant. Thanks. This morning a voluntary Australian arrived at the restaurant. She will stay with us 2 weeks to teach English to children and play with them. Thanks.